A Yorkshire Dales walk that includes riverside paths, woodland, moorland, two rocky summits and wonderful views over Wharfedale and Nidderdale. 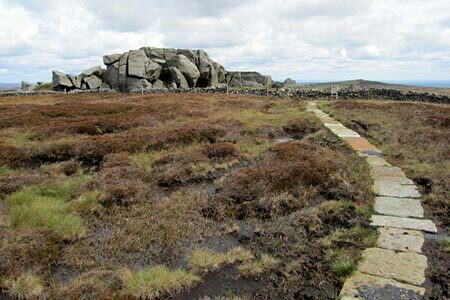 The route follows good paths throughout and with few navigation problems. A GPX File is available for download (see walk description). This guidebook contains 43 circular day walks in the north and east Yorkshire Dales. It explores the dales, hills and moors between Kirkby Stephen and Pateley Bridge. Walking ranges from gentle 3 mile strolls to more strenuous day-long rambles across the Howgills, Wensleydale, Swaledale, Nidderdale, Mallerstang and Coverdale.